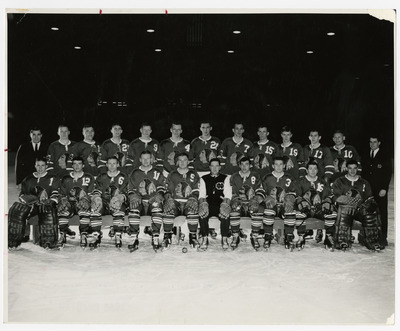 "Team Photograph, 1964-65 UND Hockey Team"
Photograph of the 1964-65 UND Hockey team. The team set a new record for most wins in one season, with a total of 25. This photograph can also be found in the 1965 Dacotah annual, page 84. Front row: Joe Lech, Terry Casey, Roy Davidson, Dave Mazur, Don Ross, Head Coach Bob Peters, George Kell, Richard Ulvin, James Dixon, Dale Stauss. Second Row: Assistant Coach Bill Selman, Paul Rygh, Peter McKenzie, Dave Janaway, Dennis Hextall, Jerry Lafond, Brian Strimbiski, William Wilms, Ken Walters, Robert Lillo, Tom Iannone, Manager Robert Stoyko.